Wednesday 18 April marks the anniversary of the forced deportation of Nubians from their homeland on the banks of the Nile. Egyptian Twitter subscribers – many of Nubian origin – shared memories, photos, songs, book titles, and grandparents’ stories. The majority of Nubians forced to give up their land almost 50 years ago were resettled in 46 villages in the Nasr Al-Nuba district. Although Nasr Al-Nuba was built specifically as compensation for those uprooted by the Aswan High Dam, none of the Nubians actually own the houses they live in or the land they work on there – and many received no compensation at all. The 46 villages have retained the same names as the old ones: Balana, Kalabsha, Daboud, Dihmeet, Dokka and Siala. There is also Ibreem, famous for its dates and the subject of a folk song performed by the Nubian pop icon Mohamed Mounir. While the names my have been preserved, however, the character of the relevant villages is lost. The present villages look much like any other village in the Delta or in Upper Egypt. One major difference is that the houses overlook the desert rather than the Nile. 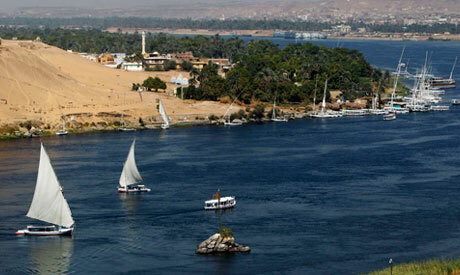 Missing their homeland, missing the Nile was a very common theme in today’s Twitter messages. One of the top messages today was by @voodoo_44: “This is what my great grandparents used to do open the door and see the Nile flowing quietly”; Voodoo attached a photo. Writer and activist Fatma Emam’s blog “What Do Nubians Want?” summarises the issue: "Although Nubians proved many times that they belong to Egypt and they are willing to sacrifice for a better tomorrow, Egypt as a government neglected Nubians and as a population discriminated against them. One might ask what are the demands of Nubians now? Full citizenship, where their history is celebrated and taught in schools as part of Egyptian history, going back to the land around the lake, naming the lake (currently called Lake Nasser) Nubia Lake and having a say in the development plans in their region. Nubia is not a homeland we live in, it is an identity and cause we live for." Overall the language of blog posts and Twitter was one of clear, human rights-oriented demands, not of rhetoric: @shaimaa_rashad stated, “One of the small things that show marginalization is that you can't find books about #Nubia easily in bookstores”. @nubianawy added, “Until now there is absolutely no one to represent us, in other words we are not satisfied with the official representation because it is commissioned by the government and governor of Aswan which is a big problem”. @alytalibab: “Nubians sanctified land and nature way before environmental NGOs were established”. @basmasaghir: “I am an Egyptian Nubian and against separation calls I call for our lost rights and not ignoring our demands." Many posted on Twitter and blogged about how insulting the stereotype in movies portraying Nubians as doormen and chefs is. A discussion between Twitter subscribers resulted in the preference of using the term indigenous people rather than a minority to describe the five million Nubians in Egypt.